The figures are revealed in The Spirits Business’ annual Brand Champions report – a compilation of the world’s spirit brands selling over one million nine-litre cases a year. Up until 2013, the largest Indian whisky brand was McDowell’s No.1 Reserve, owned by United Spirits. While the brand achieved similar growth to Officer’s Choice, its total volumes fell 220,000 short of ABD’s flagship brand. “Allied Blenders and Distillers is committed to continuously provide rewarding and fulfilling experience to its consumers,” the group said in a statement in reaction to the news. 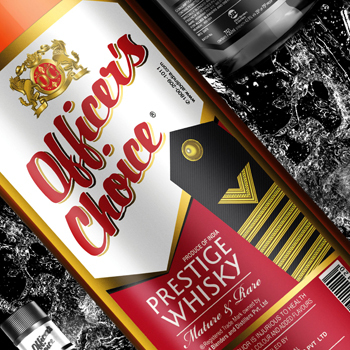 “One of our core values is ‘constantly innovating and being different’ and Officer’s Choice has continuously reinvented itself to remain relevant in changing times. The 2014 Brand Champions report, which also includes a list of the Top 100 Spirits Brands by volume, will be published in the June issue of The Spirits Business. Is it actually a whisky though or is it a IMFL?